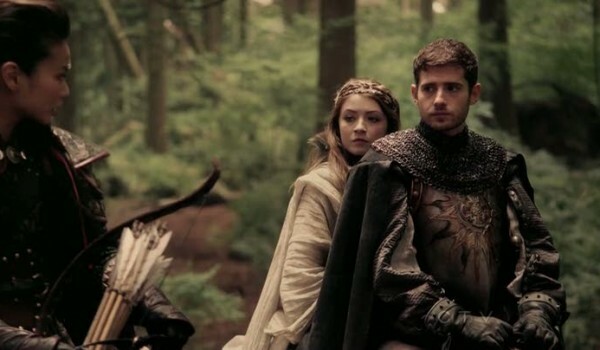 Technically speaking the scene of Phillip waking Aurora up was the first thing I ever watch from Once Upon a Time thanks to the casting post for Sarah Bolger. I was confused then but as it turns out it’s meant to be a little confusing. This episode picks up right where Season 1 left off, everyone is pissed at Regina and wants to murder her. Emma jails her and Mr.Gold marks Regina as a wraith prey because of what she did Belle. So the show now has wraith in it, okay, sure. The wraith also attacks Aurora, Phillip and Mulan who is Phillip’s warrior pal. Regina uses Jefferson’s hat to send the wraith to the fairy-tale world which is just an oblivion as this point however while this plan does work Emma and Mary-Margaret are pulled in too. And in the Fairy Tale Enchanted Forest Aurora, Phillip and Mulan try to get away from the warith but Phillip is marked and gets his soul sucked out. Mulan also them revealed to Aurora that while she was sleeping everyone else was also in a 28 year old slumber and they too just wake up. At the end the two find passed-out Emma and Mary-Margaret. Overall I liked this episode. I like that plot has a current Fairy-Tale story running alongside the Storybrooke plot. THough actually season 2 has three plot per episode so hopefully it won’t be too hard to discuss them. I will say I’m not sure how to feel about the wraith. They are technically not out of place within the context of the story but they feel out of place somehow. I also like how Mary-Margaret really wants to be Emma’s mom and Emma is really reluctant. Emma has to be older than Mary-Margaret at this point right? And who is Dr Whale? The mention that at some point and I was wondering that all throughout last season. More secrets…yay. Hey! I tried the link at contact me and clicked the image but it doesn’t work, I wanted to send you some NDdP material I got that is very interesting, is there any other way I can contact you? You can also send me an email if you prefer, I am not sure if you can see what I write in the email box to send the comment, if you can’t, just reply me and I’ll comment my email. Thank you so much! I sent you an e-mail , it’s about NDdP comics, hope you enjoy it! Have a nice day!